Gonzalo Pizzaro was a Spanish conquistador who travelled to Peru with his brothers in order to conquer it. Gonzalo’s history isn’t particularly favourable, but thankfully this slot game focuses more on his life as a traveller, and therefore the character Gonzo is only loosely based on Gonzalo Pizzaro. 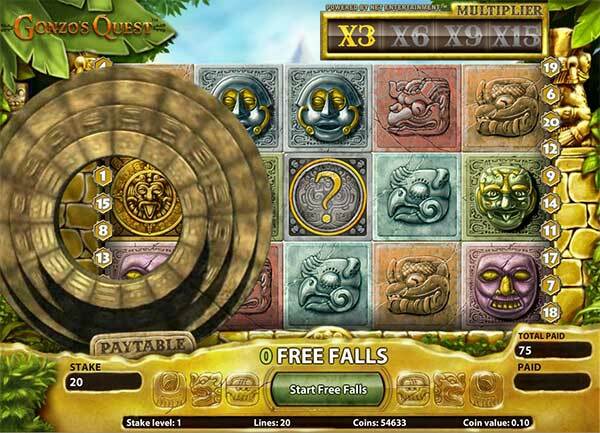 This slot game follows Gonzo on his quest to find Eldorado, the lost city of gold. Help him find it, and you’ll be handsomely rewarded while you discover more. 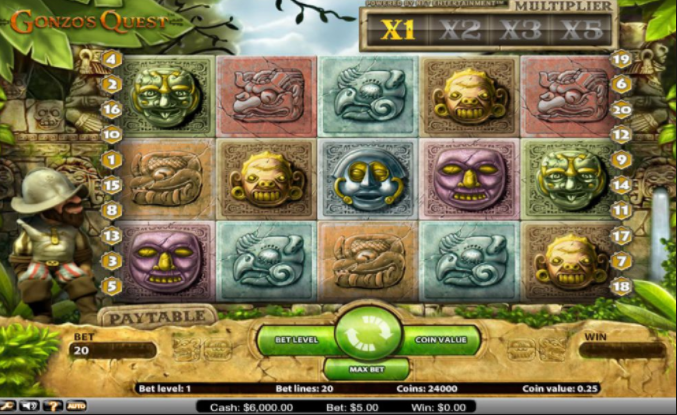 NetEnt is one of the top Barbados slot games providers in the world, and have been around since 1996. Their games are built on a combination of mathematics, pure passion, storytelling, and the highest quality graphics and animations, which has kept them ahead of the game for years. They have a huge suite of online slot games, and if you’re looking for other inspired slot games from them, try: Creature from the Black Lagoon, Dracula, Frankenstein, and Jack and the Beanstalk. Setting this bingo play slot game apart from the rest, Gonzo’s Quest starts out with an intro clip to how Gonzo starts his quest – by running away from the other Spanish explorers and going to find the city of gold for himself! You’ll then be transported to an Incan ruin, with Gonzo at your side, and you’ll be presented with the five-reel slot game. Gonzo will continue to read his map, and watch your game. The reels are set up on what looks like an ancient Incan ruin, and is full of symbols of different carvings of people and animals in various colours. The highest-value colour being the grey and gold, and the lowest being the pale blue. Wild symbol – this is the grey stone with a gold question mark in the middle of it, and it substitutes for all other symbols on the reels, except for the freefall symbol. Freefall symbol – this is a gold medallion, and landing three or more of these will give you ten respins, although because of the way the game is set up, these are actually falling symbols as opposed to spinning reels. You can also trigger up to 15 more free respins, and the falling symbols will bring bonus coins, which Gonzo will run and collect in his helmet. Avalanche feature – as mentioned above, this game is set up slightly differently, in that the symbols ‘fall’ into the reels as if they’re part of an avalanche. Then when you match symbols they will explode, bringing more falling symbols into winning paylines, and this will continue until there are no more winning paylines. This greatly improves your chances of winning bigger payouts. This is a hugely enjoyable slot game that fully immerses you within the world NetEnt have created – the intro clip tells the story and helps bring the game to life. The high-quality graphics and the extra bonus features give more opportunities to win, especially the avalanche feature that’s been installed. Plus, it’s mobile responsive, so you can even enjoy Gonzo’s Quest on your mobile. Two thumbs up here! Click here for another amazing quest game worth playing with huge wins!